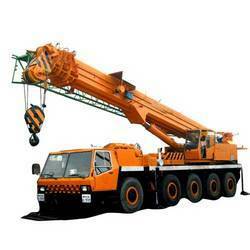 Our range of services include terrain mobile crane hiring services. As an acclaimed enterprise of the industry, we are engaged in offering our clients Terrain Mobile Crane Hiring Services. These services are required for lifting or lowering heavy loads in construction projects. The arm of the crane can easily extend to the desired heights in a hassle-free manner. Offered crane is highly demanded in dockyards, shipyards and civil engineering works.